I love uniquely regional travel experiences, and if you do too, you need to travel the Sonker Trail in Surry County, NC! It’s a delicious homestyle, feel-good, make your insides happy dessert, and it’s a North Carolina thing. Surry County, to be exact. A sonker is a combination of cooked berries with a dough or crust topping, and the fun part is that no two recipes are alike. It’s all based on family tradition. In fact, the sonker is such a beloved regional confection in Surry County that there’s a Sonker Trail and a Sonker Festival to celebrate it. I made it my personal mission when I was on a Yadkin Valley FAM last summer to visit as many of the Sonker Trail locations as I could, and I made it to all but one! The key to a great sonker is to use very, very ripe fruit. The origin is believed to have come from the desire to waste nothing, so all the freshly fallen fruit in the orchard is perfect for sonkers! Other than type of fruit used, I found the biggest difference between them was in the crust, which varied from dropped dumplings to rolled crusts to a southern style cobbler topping. Fortunately for everyone visiting the Sonker Trail, they were all worth trying (and believe me, I’ll get back to the one stop I missed eventually). 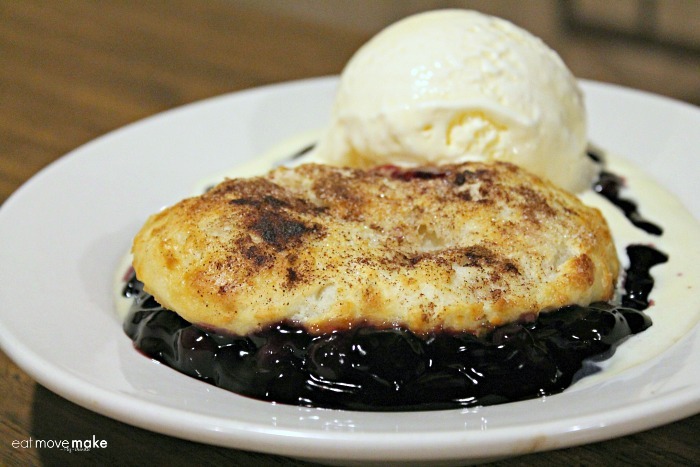 Southern on Main (downtown Elkin, NC) – This blueberry sonker had a nice thick biscuit-style topping with plenty of berries below. It was the first sonker I tried, and when I tried it, it wasn’t yet a part of the Sonker Trail so it was kind of a freebie intro. Lucky for you, it’s now on the trail! Roxxi & Lulu’s (Elkin, NC) – Based on grandma’s recipe, the sonkers here are made with either a biscuit mix or a from-scratch sweet dumpling batter. The summer berry sonker with raspberries, blackberries, strawberries and blueberries I tasted had the biscuit topping. They use butter and shortening in their mixes, and it shows. Delicious! In the fall, they’ll often serve sweet potato, butternut squash or apple sonker — sometimes even mixed together! Down Home Restaurant (Mt. 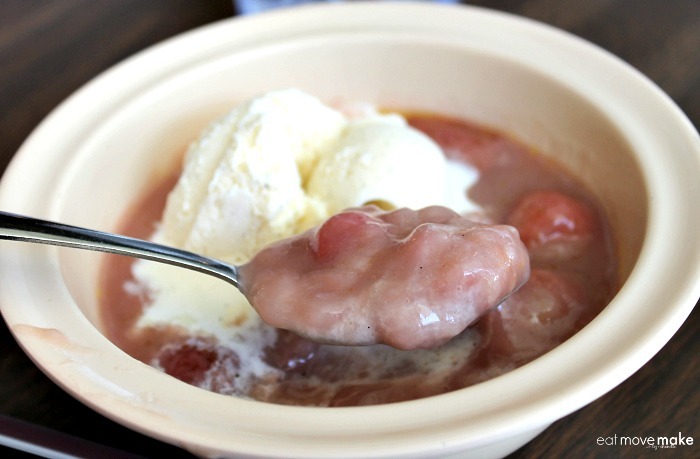 Airy, NC) – The sonkers at Down Home are made by first cooking the fruit on the stove, then pouring a liquid batter over the top and baking it. It was very different from all the others I tried. Some say it’s the most traditional of sonker styles. Old North State Winery (Mt. 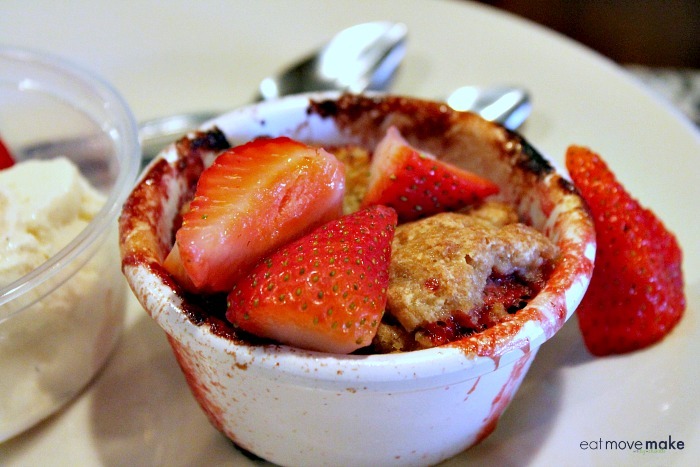 Airy, NC) – We enjoyed strawberry sonker at this downtown tasting room and cafe. Our server said they use a little cake mix in their recipe, and she described it as a combination of pie and cobbler. They often serve sweet potato sonker at this location. 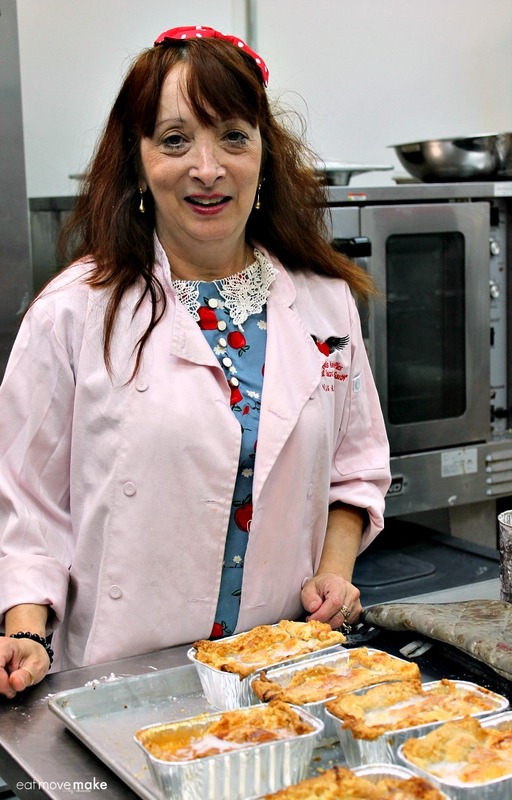 Miss Angel’s Heavenly Pies (Mt. Airy, NC) – Miss Angel is a native New Yorker, and she likes to do things her own way, so sonker is “zonker” here, and her recipe is uniquely her own. Miss Angel starts with an 85-year old family pie crust recipe, then gives it a southern spin by soaking moonshine and honey into it. She also offers the option of a moonshine glaze and one of ten moonshine ice cream flavors from the ice cream shop next door. I tried a peach zonker with moonshine glaze and peach moonshine ice cream. Phenomenal! The Living Room (Pilot Mountain, NC) – Sonker here is made with a buttermilk biscuit pastry cut with whole milk ricotta and butter. They make both sweet and savory sonker flavors, and I absolutely loved the pear, ginger and buttermilk sonker she served us. This was my favorite sonker of all! Putters Patio and Grill (Dobson, NC) – The sonker here was the most cake-like of all the sonkers I tried, and it was absolutely delicious. It reminded me of bread pudding a little bit, and I loved it! Sonker flavors vary from day to day and location to location, and are typically based on whichever fruit is ripest at the time. In the fall, you’ll often see more of the savory options like sweet potato appear. To appreciate all the sonkers, you’ll likely want to stagger your Sonker Trail stops over a couple of days, but all the locations are within about a 30 minute radius of each other. Visit the Sonker Trail official website for all the details. Check out my posts about Mayberry/Mt. Airy and Yadkin Valley wineries for ideas on what to do in the area between sonker stops, and take advantage of the great resources at YadkinValleyNC.com to help you plan your visit. WOW! I love trying out unique food that are popular in one place. It’s my first time to hear about sonker and it looks like something I would like. Oh man! All of these desserts look amazing!! I definitely to check out the Sonker Trail the next time I’m in NC!! All this looks wonderful! However, moonshine ice cream flavors? I’m definitely gonna have to put Sonkers on my bucket list. Very interesting. You learn something new everyday! Honestly I am hearing about the Sonker Trail for the first time, but my goodness this is just amazing & mouth watering stuff that no one would want to miss. I would love to travel anywhere to make sure I get the most of these delicious recipes! Never heard of this dessert, but they look so appetizing, especially with the berries on them. I lived in NC for 8 years and I’ve never heard of this! lol Maybe because I’m picky and probably wouldn’t eat this though. I have never heard of the word Sonker, and now I get to learn all this awesome stuff, including recipes, trails, travel yayyy, thanks for sharing! I’ve never tried sonker, but I will admit that it looks pretty appetizing. I love how you can make different versions of it. What an awesome tradition!!! All the ones you showed look so good! Definitely something to check out if I’m ever in the area! This post makes me want to travel so I can sink my teeth into this dessert. I’ve never heard of it before but goodness, it sounds so scrumptious. This all sounds delicious, I don’t know how I missed out on this. I feel robbed of my 7 years in Mt. Airy. Miss Angel’s Heavenly Pies sound like a winner. I bet the sweet potato ones are even better. Never heard of sonker trail but loks so delicious! It’s great to find out new regional recipes. Hope to be able to taste this sonker asap! Wow, all that food looks great! What a lovely little restaurant. I would honestly go “bonkers” with those! Seeing a variation in the name ultimately means that it’s being passed around. It’s that good! Haha so to be honest, I have never heard of a snoker before!!!! They do look super yummy though! I’ll be visit North Carolina in just a few weeks, so I’m glad I’m seeing this post. Currently taking notes on where to go. These all look like delicious places to stop in North Carolina. Pinning for later! Sonker is yummy. I have never heard it called that but it is very much like a compote. Never the same way twice or never the same recipe between persons. YUM! I think I would visit North Carolina just to try that pastry out. Looks and sounds so delicious. What a great individualized family recipe. Kind of cool that everybody makes it different and whit their own touch. You could have a differrent flavor or touch to it with every one that you try. Cool! I’ve never heard of sonker before. This dessert looks yummy! I want to try a piece of Miss Angel’s heavenly pie. Looks delicious! I’m not a huge cooked berry dessert person, but these do look incredible. I can’t believe there is a whole festival around this unique dessert. I have a feeling the last one with the pear and ginger would be my favorite as well. I’ve never heard of a “sonker” before – they look delicious though! Glad you had a fun sonker adventure! My mouth is watering for sure, now! These look absolutely DELICIOUS! This is a new thing for me! I’ve never heard the term before. Love it! This is so great and so unique and fun. I’d love to try these!! Pie, cobbler, sonker. I’m in heaven. Each is so unique, but they all look amazing. I need to get myself to North Carolina! Oh my, I am going to have to move now. I want a sonker and I want it now! Sonker Festival sounds like a lot of fun! 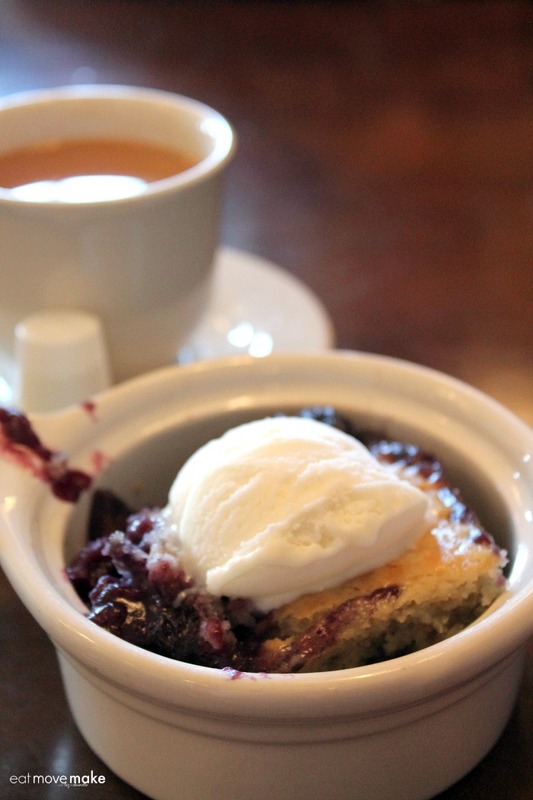 I’d love to try Southern on Main blueberry sonker and Old North State Winery strawberry sonker too! I have the worst sweet tooth so desserts are my thing…. these all look incredible. Must make a note to visit if I ever can! These look like personalized cobblers and sound amazing. I love fruit based desserts. Oh my gosh, that looks so good! How have I never heard of this before? Is it similar to like a crisp with the fruit and crumbly topping? I’m a sucker for desserts and these look like some great ones. The sonker is making my mouth water. This is the first time I hear abou this but it looks delicious! I have never heard of this before, it looks delicious though! We will actually be in North Carolina this summer and we willl have to try these! I’ve never heard of sonker before and I live in Asheville! Clearly I need to change that. Thanks for the road trip idea! This looks like an unique dessert for sure. Sonkers, what an interesting name…never heard of these before. They all look good. This is the first time I’ve heard of a sonker but I think I’ve eaten it before only did not know the name. I’ve never heard of sonkers but I’ve got to try now! Everything looked so tasty! It looks really good. I love trying new foods and this one is tempting! This is such a unique and healthy food. A North Carolina thing? Well sign me up for some of that! haha. That looks so delicious. I’ve never tried or heard this it looks really tasty and fantastic! I want to try it soon. It’s my first time to see and heard about sonker trail, but it looks really fantastic! Being from Ireland I’ve never heard of Sonkers. But they look like my kind of desert. My favourite fruits are strawberries so that sonker combination works best for me. Yummy! What a fun story, learning about a local tradition like this. However, it’s time for breakfast & all the photos made me really, really hungry. Thanks for sharing & maybe I’ll get to NC one of these days for a sonker (have to laugh at the name). The pictures made me hungry! This dessert really reminds you of home and it would be nice to get to taste this from all the places that you listed above. This is the first time that I’m learning about Sonker. It absolutely looks divine, more like the perfect dessert. This is something to look forward to when I visit NC. Awwh sonker sounds so lovely and I really like the fact that they are all different! I have never heard of a sonker before! They look so good, really want to have a go at these next time the in-laws are round haha got to impress! Wow, never heard of sonker but it sounds absolutely delicious! I’m going to go read up on it some more after this! This sounds interesting! I haven’t heard of this before but U would love to try it! Looks delicious!! Oh my goodness I need to visit North Carolina soon this sonker traditions sounds amazing and so delicious I bet you had so much fun =) Happy 2017! This is all new to me! However I always think where you travel you should try something very local. I’ve never heard of sonkers before. But after reading your post and seeing all the yummy photos, I would love a taste of any of them, especially the blueberry one. Wowzers this has me drooing. I had no idea such a yummy treat existed. I am going to South Carolina in may for the big BlogPaws Conference. Can I find sonkers there? MMMM good! The blueberries with it sound divine. Sounds amazing and looks amazing too! There’s nothing like food that reminds you of your childhood. I’m sure each on of these were delicious. I have no idea what’s Sonker is but this is absolutely stunning! They are all looks so delicious! I think I have to spend my whole day in the city to look for the Sonker! lol! The sad thing is, I live in Mount Airy, and I have never heard of this. It looks really delicious though. I need to ride downtown and check them out! Any excuse to eat sweet crust with syrupy glaze…and some fruit…is a good one for me! Sounds like an awesome reason to gain a few pounds. I’ve never heard of a sonker, but it looks really good. I’ll have to keep my eye out for it in my travels! I have never tried this. Its a great thing to make with some left over biscuit mix – you know when there are 3 of you and you’ve made 12 biscuits – should you make more and pig out on biscuits or do something healthy – sonkers with raspberries. I am feeling a serious need to go try a Sonker now! lol!! I have never heard of Sonker before, but that looks delicious. I have got to try that sometime. I’m glad that you shared so that I can try it sometime. They all look so darn good. I have had a sonker a few times and I loved them. I will have to get the ingredients I need to make some for dessert this weekend. It will be perfect for my dinner party. This looks like an amazing treat. 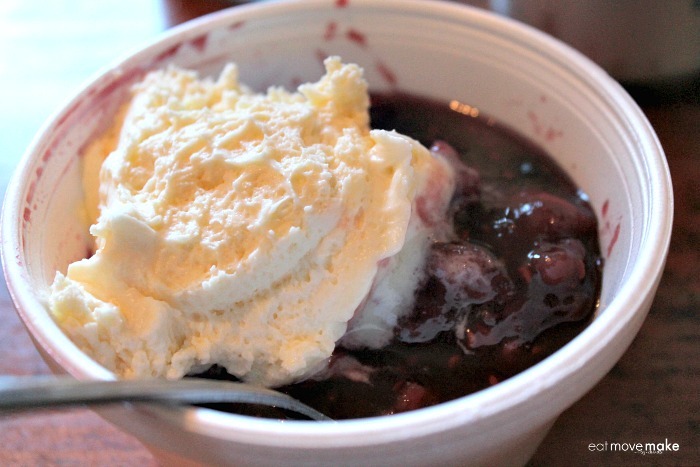 I will have to try making a blueberry sonker for dessert this week. I have never tried a sonker before. These all look so delicious. I want to start with the blueberry sonker. This looks like such a delicious treat! I have never heard of one before but if I make it to this part of NC I am certainly going to try it. It’s the first time I’m hearing of sonker but I’m already liking it! 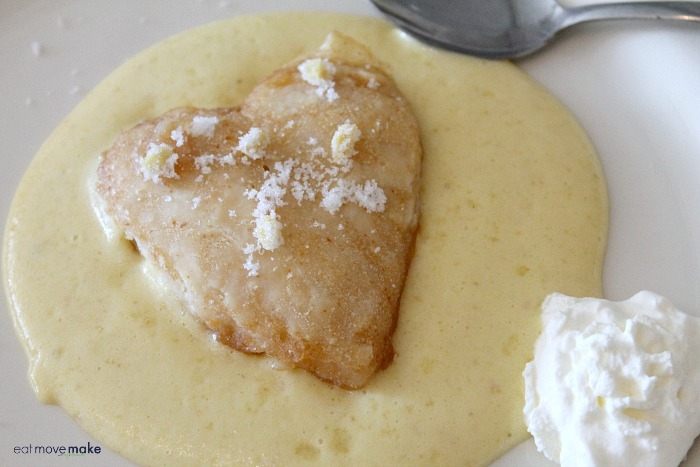 I keep imagining how it tastes like…maybe like cobbler-pancake-cake? I love how unique it is! Must try one. First of all, sonker is such a fun thing to say! Second, it looks so delicious. I’d love to so on a sonker crawl and sample all of the different varieties! I love in Mass and never heard of these. They sure do look good though! I love the beauty and culture of NC! I have never heard of this before but I would LOVE it. The pictures look amazing. I must try this someday. It must be because I have never heard of one before! these treats look absolutely to die for, I have got to try one. This is the first I am hearing of sonkers but they sound delicious. Since each is unique, trying them all would absolutely be a must! 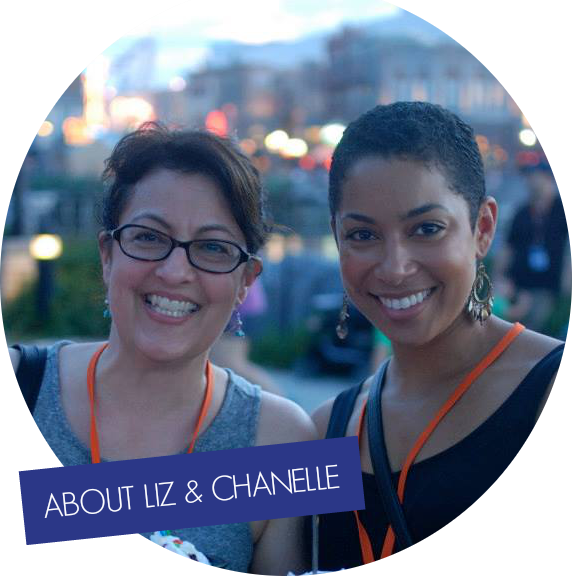 I love the idea of tying my love for food with a fun adventure! And this one looks like it was a truly sweet treat – I love how many variations there are of the sonker! Each looks more delish than the next! These all look and sound so delicious. Thanks for sharing them. I will try them for sure. I like when people use up every bit of something and Sonker’s sound lovely. Oftentimes, we throw away good food because we think it’s gone bad. Sonker’s prove that just because something looks bad (overripe), it doesn’t mean you can’t make something delicious from it. Oh ive never heard of this before but it looks amazing! That food looks so decadent and delicious! I may have to visit just to try it! I’ve never heard of a SONKER before , very interesting. They look amazing!! I’ve never heard of sonker before but it sounds delicious. And, I think it sounds right that a dessert like this is made to save wasting fruit. They all look and sound delicious! I had never heard of a sonker before but I do have a sweet tooth and I love trying new things. This looks incredible! I’ve never heard of a sonker before, but it reminds me of a cobbler…sort of. Or a fruity dessert with a dumpling on top. Yum! Ive never heard of snoker before but looks and sounds delicious! Shame we dont get them around here! That Strawberry Sonker looks so good just about now! Wouldn’t mind taking a bite into any of these! I would love to try just a little bit to make my sweet tooth happy. They look delicious! I love sampling unique foods and this dish looks delicious. Everything you’ve photographed here looks absolutely scrumptious! My sweet tooth is totally begging for dessert now! These all look and sound so delicious. I’m going to have to take a vacation down that way so I can try them. I’ve never heard of a sonker, or of the Sonker Trail. However, now that I know what they are, I want to visit and eat as many as I can! 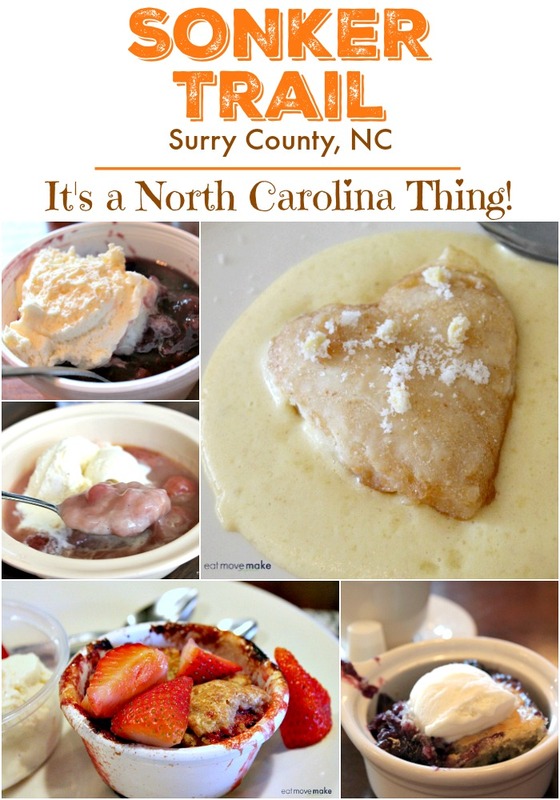 North Carolina is on my list of must visit places and now I have to make sure that it includes Surry County so that I can try some of these delicious desserts. Wow, they all look so good! I will have to add this place in my places to visit. They do look wonderful! I’ve never heard of them. Thanks for introducing us to them. I love the name, I keep saying it out loud to myself. Sonker, sonker- it makes me smile! I have never heard of it and would love to try it. What a fun combo of flavors ! Anything berry is my fave and dough just makes it better! These look so delicious. I would love to try them all ,but my favorite one would probably be the blueberry sonker. Delicious! Oh it sounds and looks so good! It seems so southern too! I’ll have to ask my friend who just moved to NC if she is familiar with sonker. I have never heard of sonker, but I can get behind the idea of a sonker trail. I love trying new, tasty desserts. I have never heard of a Sonker before!! This looks like a dessert that I would love if I tried it! I agree, that one sounds awesome. I am from Georgia so I am all about those peaches. It looks really tasty and delicious. The fruity taste would really make this healthy and rich in taste. This looks absolutely delicious. I have never heard of this restaurant but if I ever get up that way I will definitely be trying this. The food is practically mouthwatering. I am all for dessert. This is my kind of way to explore a city by eating my way through. What a fun place to visit! I love behind the scenes looks like that! Everything looks delicious! I’ve never heard of this dessert but it looks tasty! Plus it’s a dessert so pass me some! Sounds like a delicious dish – when I travel the States I love trying out the local eats, and it always ends up being so tasty! Always love it when I come across something I’ve never heard of before. Sonker surely sound delicious. Love all different names depending on region country a person is from. Sounds like a crisp we make around here. No two are alike. Ahhh! That looks amazing. How could I have never heard of this before. I must have Sonker in my life immediately. SO YUMMY! This sonker you speak of sounds magical. Hubby and I are flying into NC later this year and then driving to my SIL’s new place in SC, so I need to track this down!!! I’ve always wanted to visit NC and explore. I’ve never heard of a sonker before but it sounds like something I’d love to try. I have never heard of this before, but it sounds amazing. Perfect for a little treat. i love unique foods that you can only get in certain cities. I never heard of a sonker in my life but now I know when I go to NC I need to find one of these places and try it for myself. Thanks for sharing.